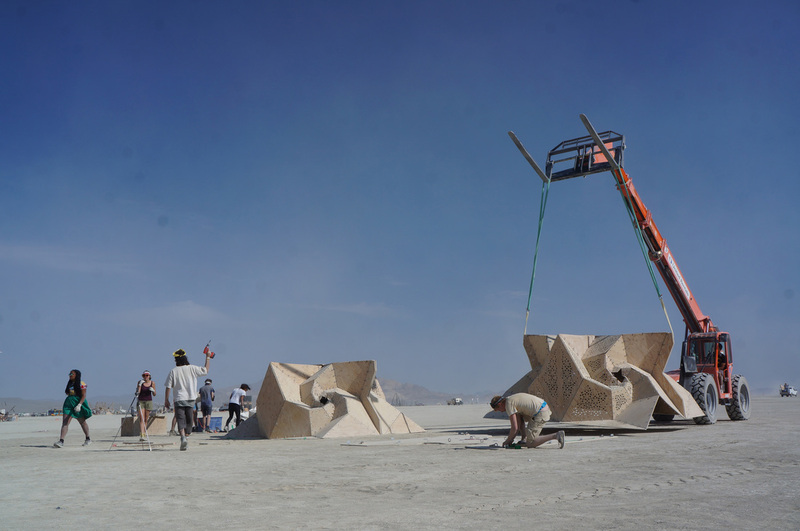 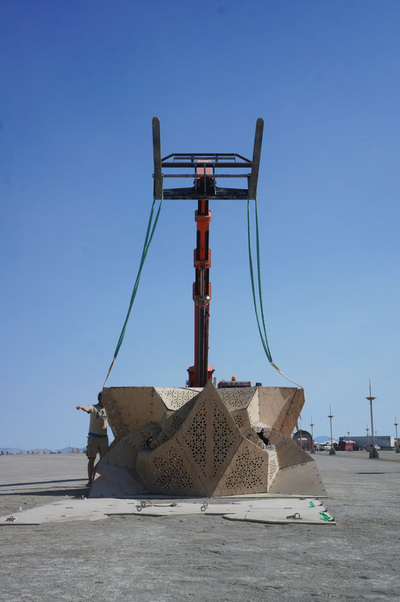 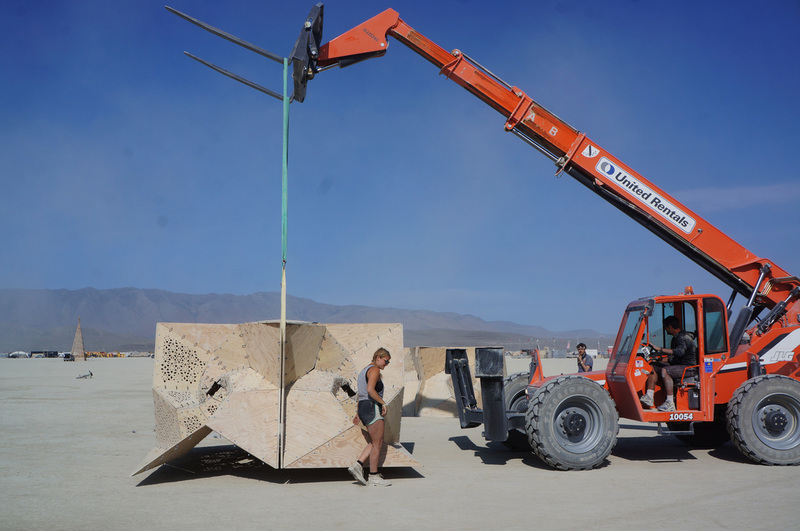 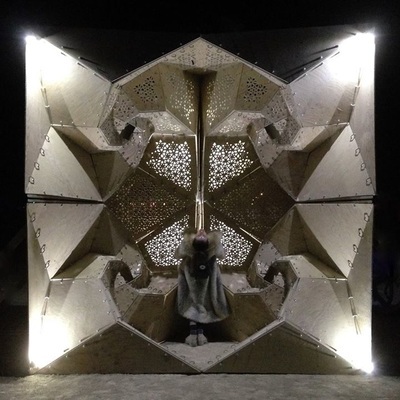 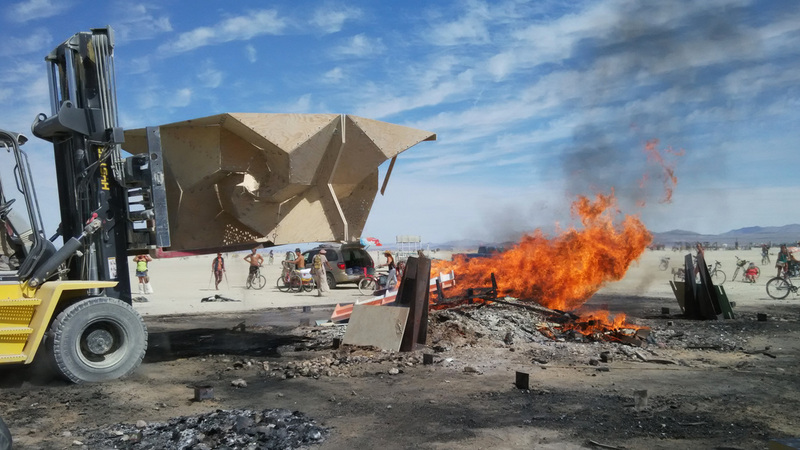 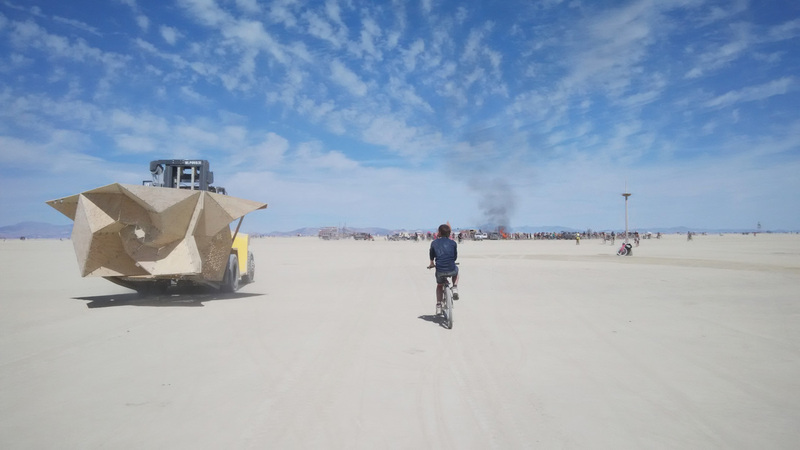 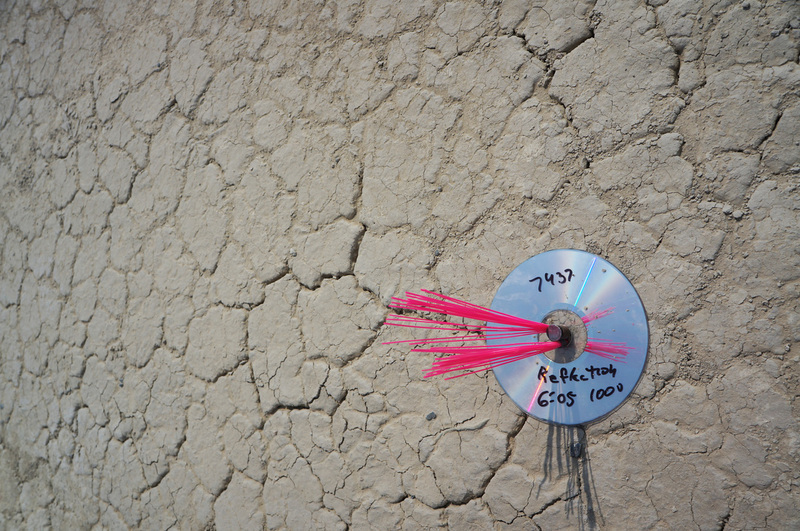 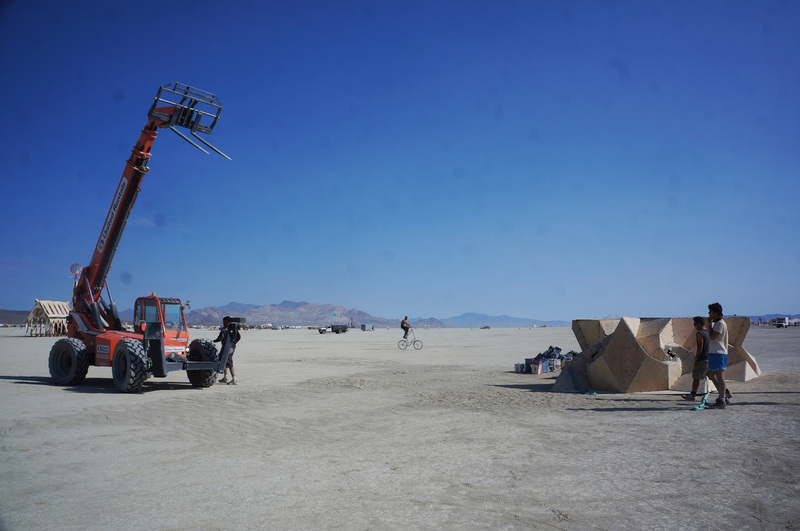 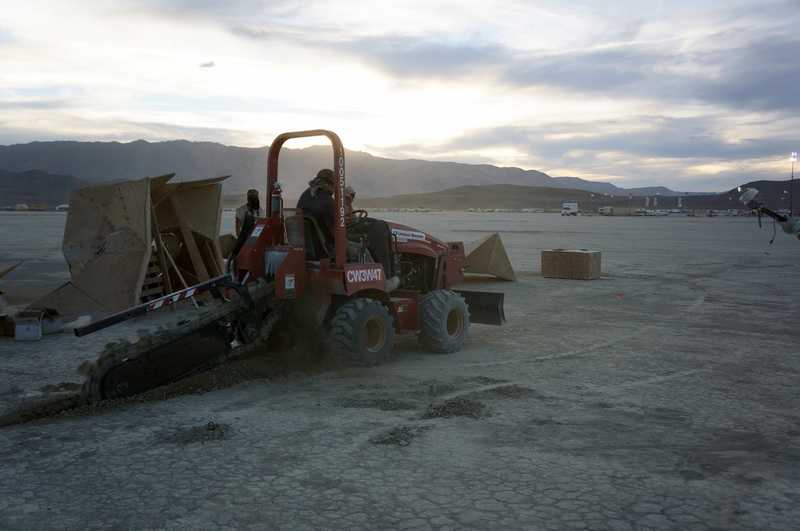 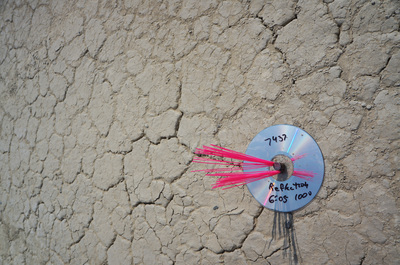 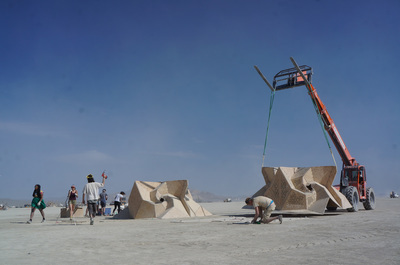 The following is a reflection written by Lorna Jackson on her experience of designing and building an installation for the Burning Man Festival that takes place every year at Black Rock City, a temporary community erected in the Black Rock Desert in Nevada. 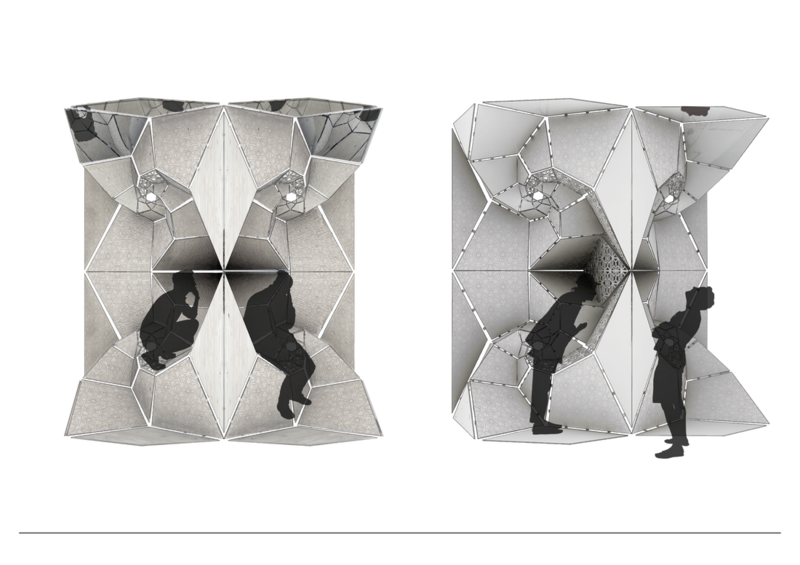 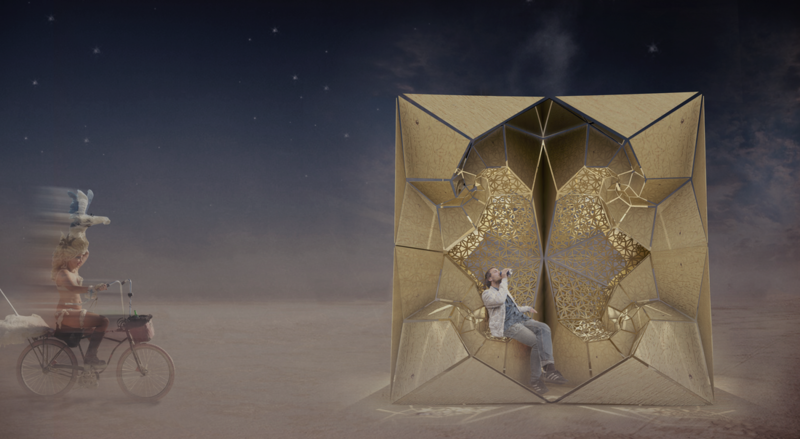 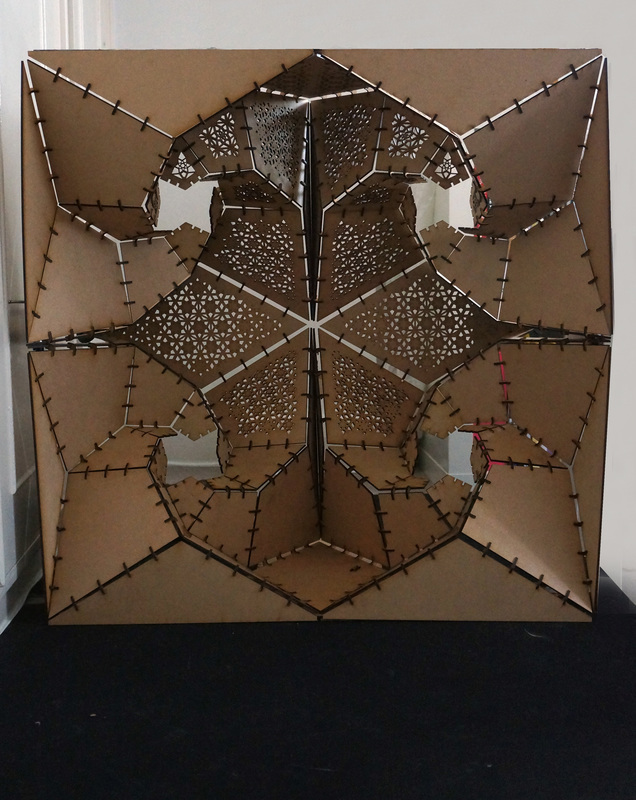 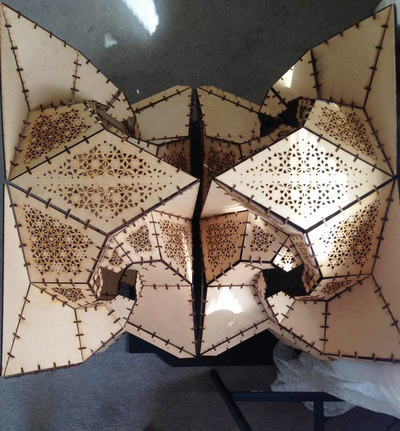 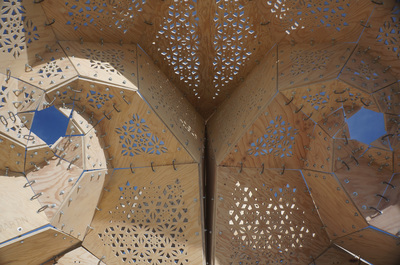 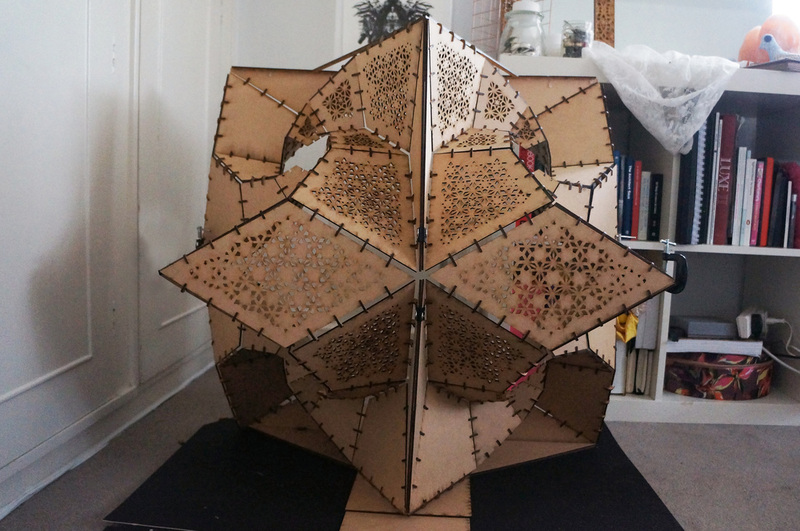 Created as a result of rigorous origami testing 'Reflection' is made of eight Spiralhedrons mirrored along all axis in order to create the enclosing plywood form and subtly embody Burning Man’s theme ‘Carnival of Mirrors. 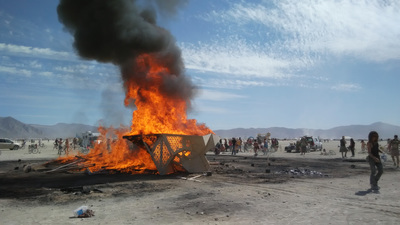 By providing an interactive base for participation Reflection is never fully accomplished without the burners involvement. 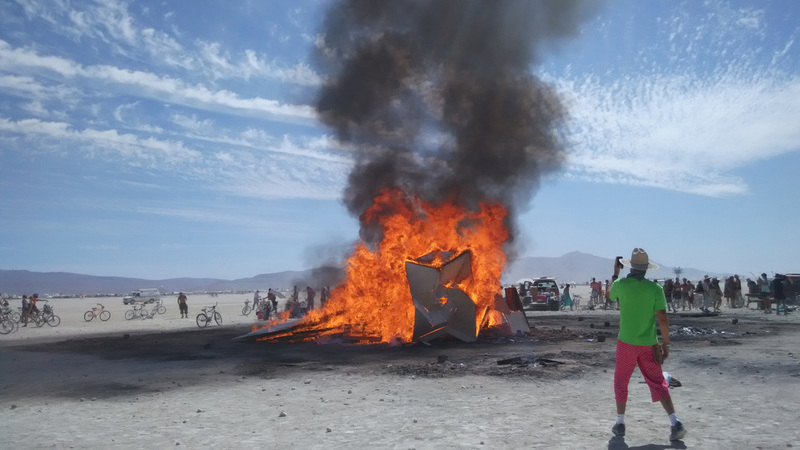 By sharing their stories, burners create a unique experience manifested through the ideals of trust and sharing, which facilitates a special bond between the burners. Upon its burning at the end of the festival, ‘Reflection’ becomes a resting place for the confessions, secrets and stories of its burners, allowing new bonds to be formed. 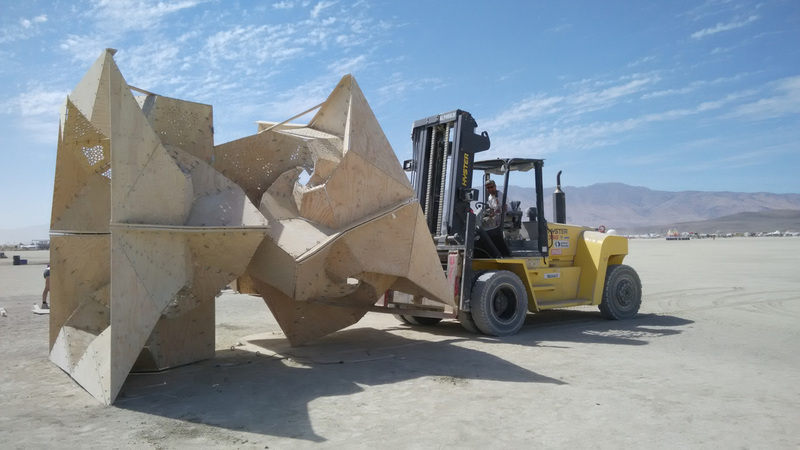 ​Encountering construction problems in the desert without the possibility of driving to the closest store to buy replacement tools etc. 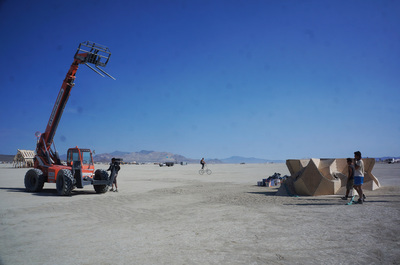 meant we relied upon fellow burners and the festivals' Artist support services to guide us. 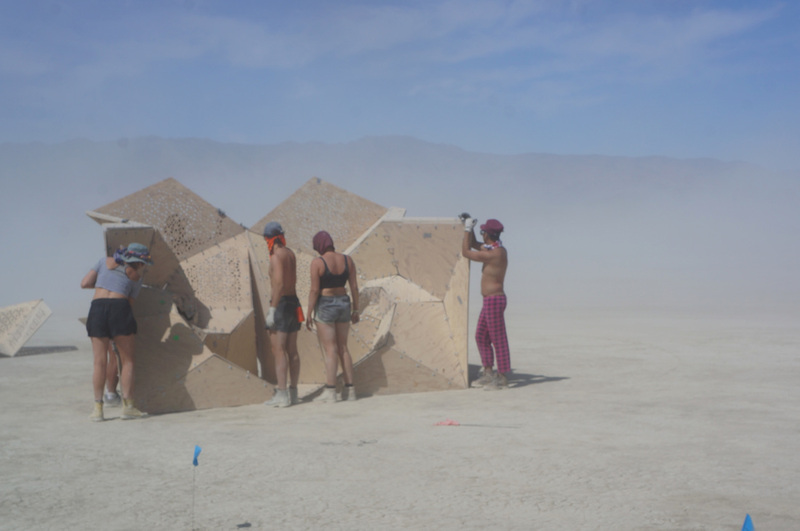 The community is as supportive, if not more so, than the articles would have you believe. 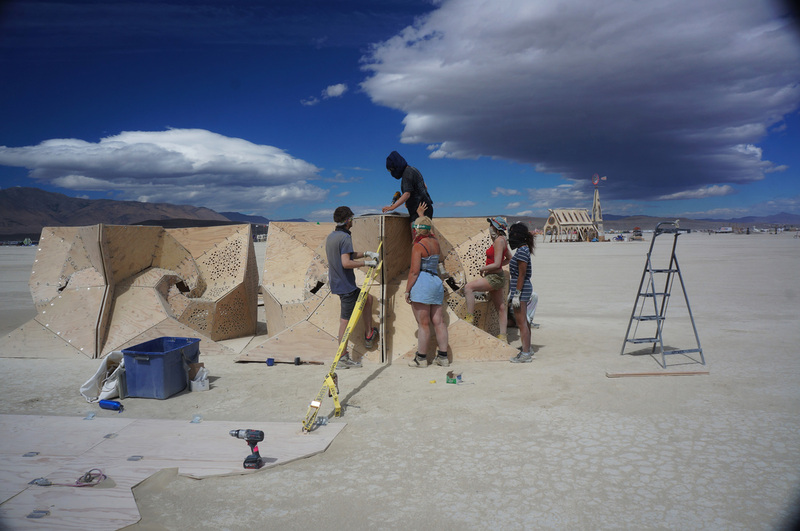 Our build team, predominantly composed of fellow Architecture students and graduates, worked through the night with numerous fellow burners to overcome any of our issues. 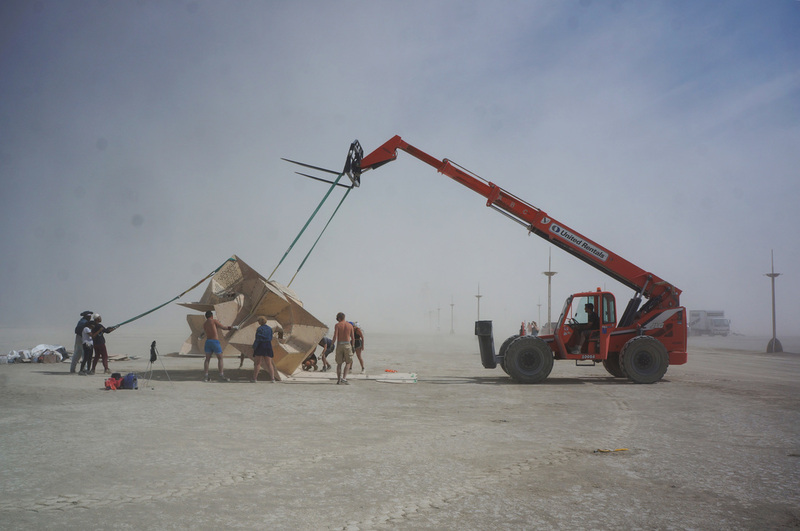 When the final bolt went in and the lights were turned on the elation was unreal. Cycling past the piece and seeing the various experiences people had with Reflection during the festival made all of the build up worth it. 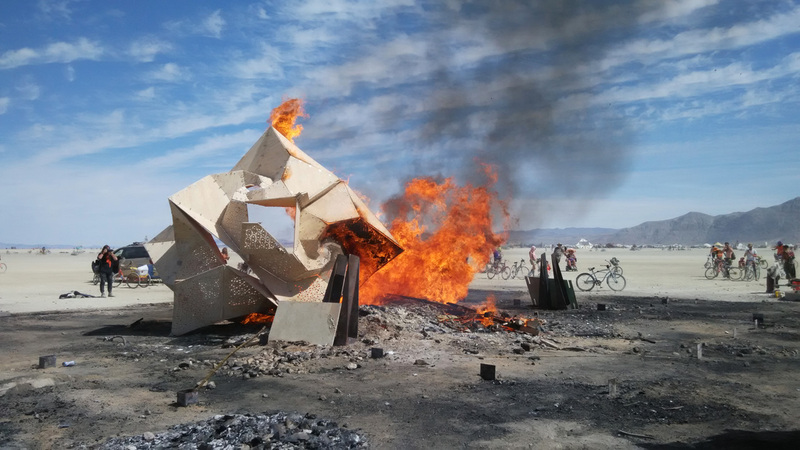 As the first large scale piece that I have designed and built I expected the burn to be emotionally challenging however it was so cathartic. 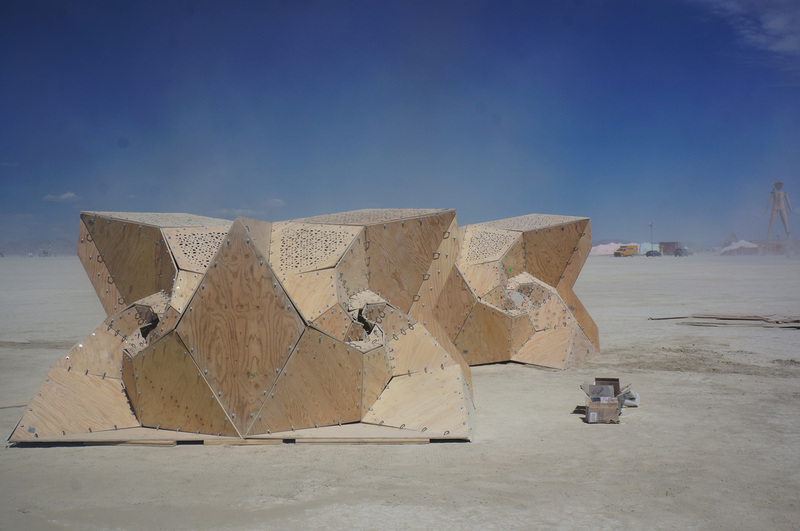 Building at burning man is an experience like nothing I've done before, and it's something I can't wait to do again. 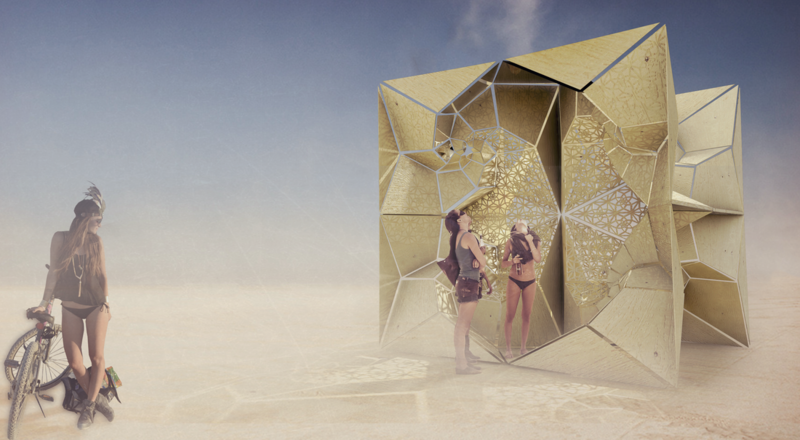 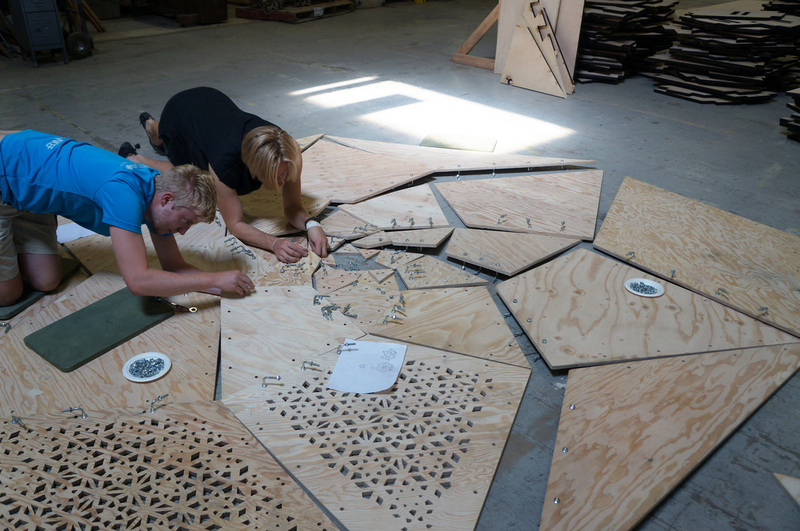 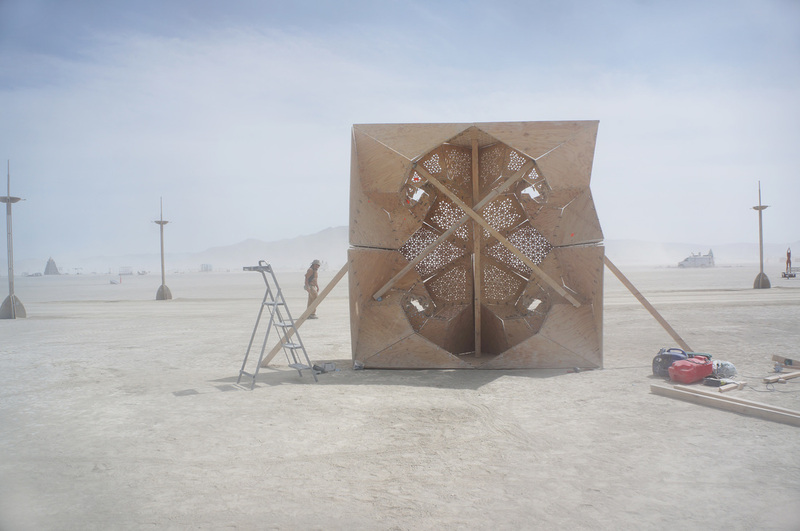 AO: What drove you to be interested in designing for burning man? 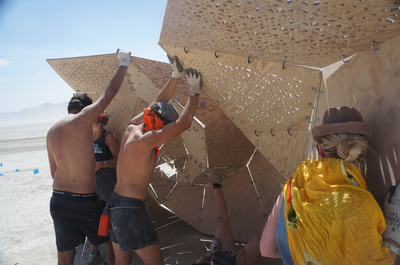 JACKSON: Having known people that had both built and attended the event I was enticed by their stories. 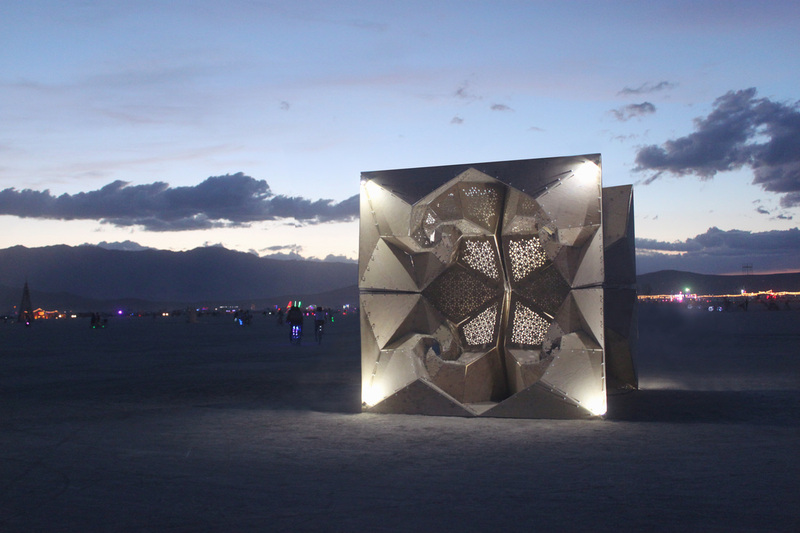 The opportunity to design, build and project manage my own piece was one I couldn't pass up. Doing this at burning man meant I was able to be around and witness how people responded to it, whether they interacted with it the way I expected. The temporal nature of the festival also enhanced the concept of Reflection: that when burnt the stories shared between the burners would be bound between them. AO: What was the most challenging moment of the build? 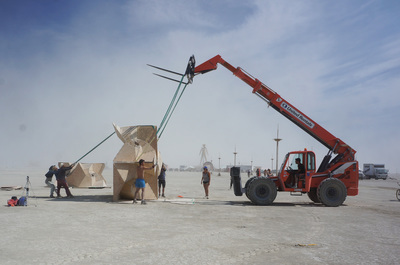 JACKSON: The hardware connecting each of the origami faces together were two types of custom made bolts, integral to build and without an alternative at such short notice when the bolts didn't arrive until five days into our two week build we had to work around the clock to make up lost time. AO: What's your favorite memory from burning man? 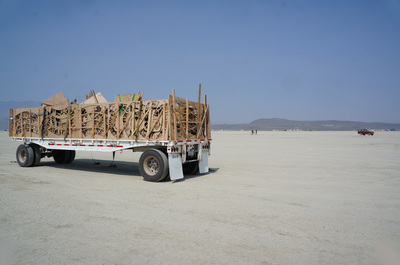 JACKSON: Arriving to playa ten days before the festival began we were 'welcomed home'. Driving to our camp site the desert was virtually empty and the landscape awe inspiring, seeing the playa grow into a city over those ten days was really incredible. 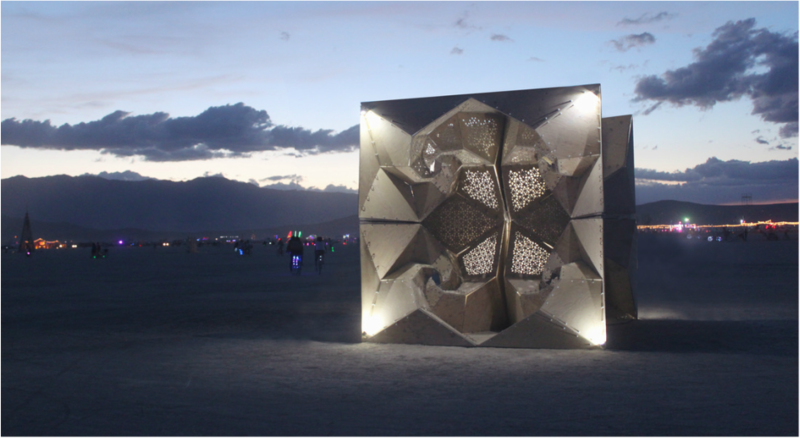 AO: What are some things that inspired reflection? 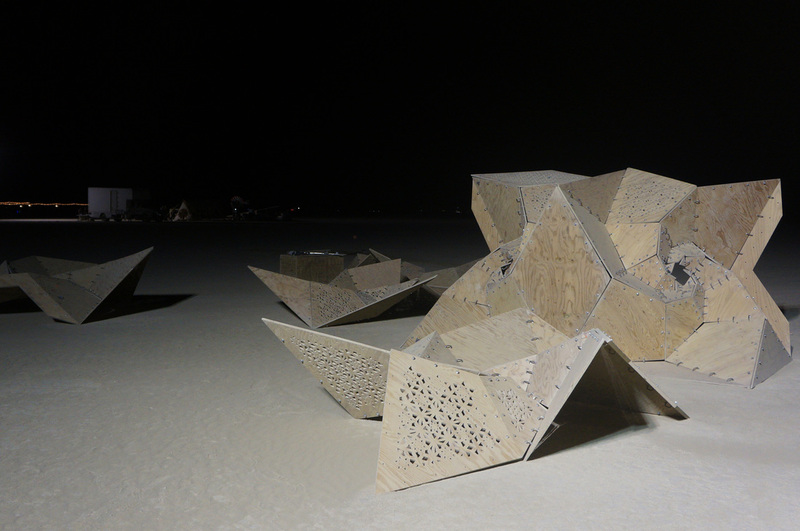 JACKSON: Reflection was inspired by an exploration into origami. 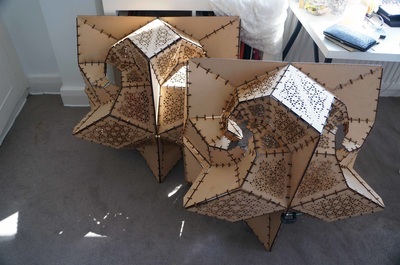 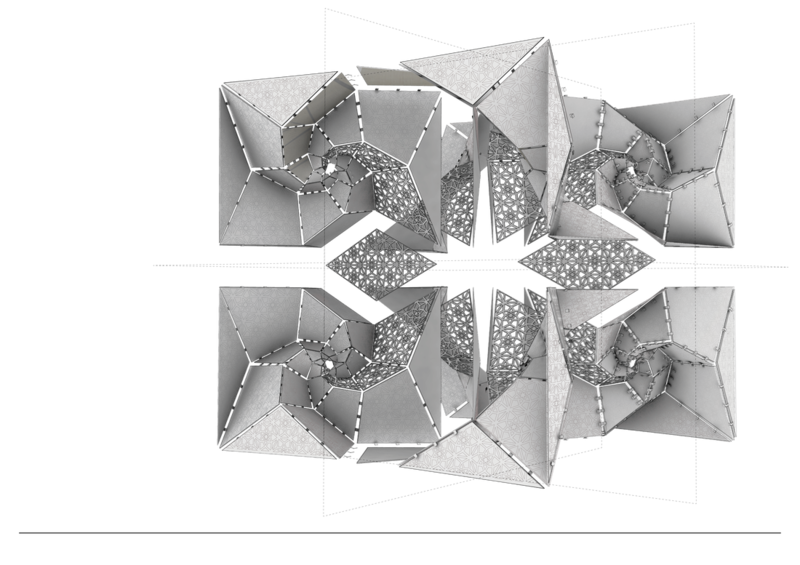 Developing parametric simulations and then making them physically before reverting back to the digital world allowed each stage to inform the other and enabled me to develop a mathematical principle in ways that it had not been before. 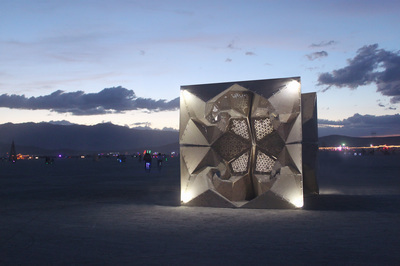 The theme of burning man was also integral to the piece, 'carnival of mirrors' inspired the physical nature of the form which was mirrored along the x y and z axis creasing an interpretation of a confessional, which in turn I hoped would evoke internal reflection. 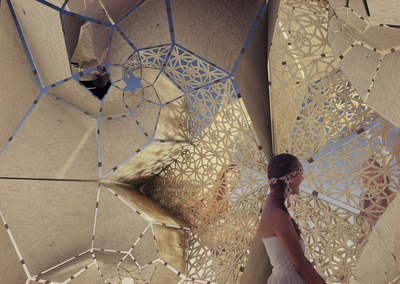 AO: How do you think this experience has helped you will evolve as a designer? JACKSON: This piece has given me the opportunity to design, manage and build my design in extreme conditions. Whilst only temporal Reflection has given me a greater understanding of elements of design that you don't get to touch upon in university. 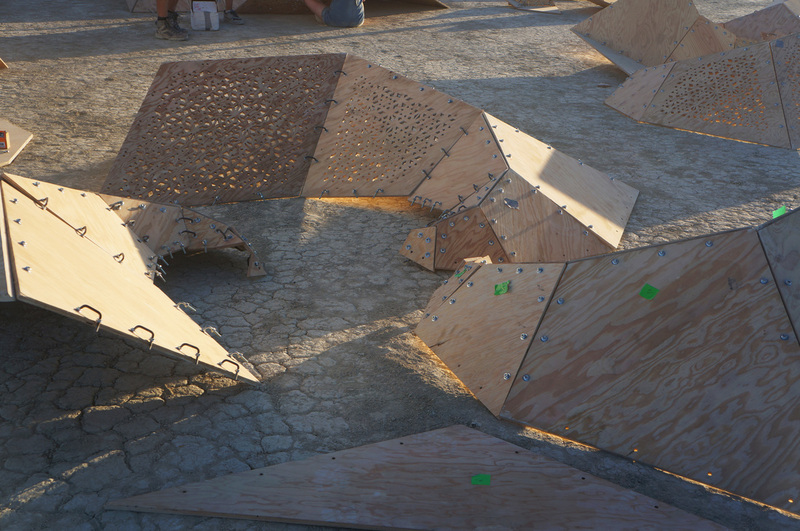 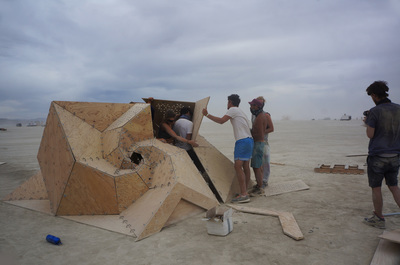 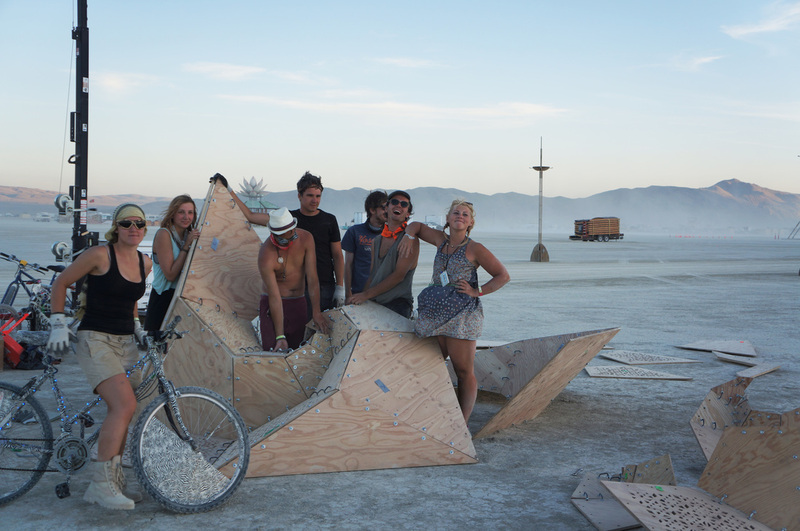 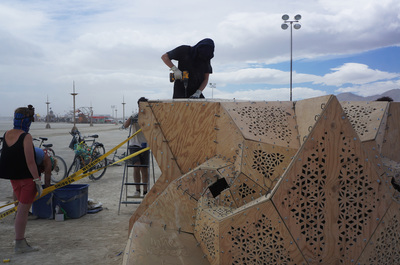 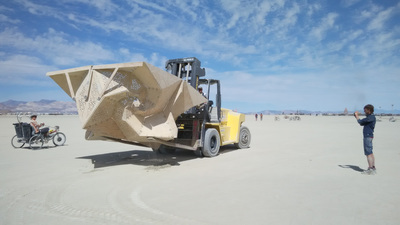 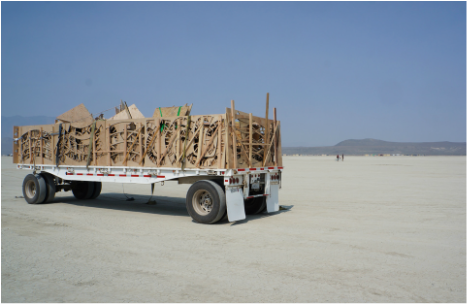 I hope that I get the opportunity to build again at Burning Man and take something even better for the burners. 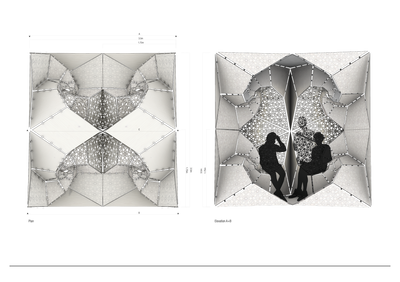 After graduating from the University of Huddersfield in 2012 with a BA(Hons) in Architecture Lorna moved overseas to work with the international architecture office, OFIS Arhitekti being initially based in Ljubljana, Slovenia, and subsequently Boston, USA. OFIS is a medium sized practice specializing in both residential and cultural architecture. Since graduating from RIBA Part 2 Lorna has started working for Foster+Partners, London. Prior to her degrees Lorna studied at the Arts at Leeds College of Art and Design and from there has developed a deep passion for all of the creative industries, shaping her architectural philosophy. 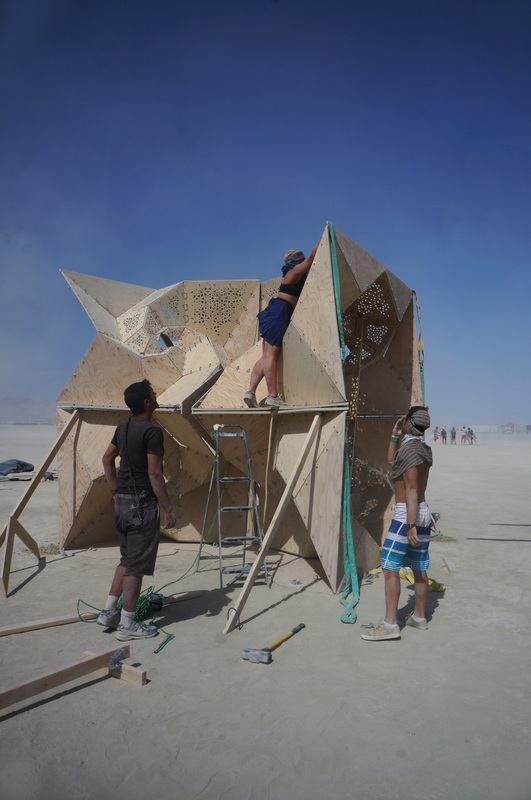 She believes that an equilibrium between sculpture, architecture, engineering and craft is integral to creating successful architecture.